In course of the new Intel Atom N550 dual core processor's (1.5 GHz) launch, Asus introduces a new Eee PC 1015P model. Based on the 1015PE, an almost identical hardware configuration with a superior standard is given in the new Asus Eee PC 1015PEM. The 10 inch netbook (1024x600 pixels) fortunately again has a matt screen. Other novelties, captured at first glance, are the latest Bluetooth 3.0 standard, a fast WLAN 802.11n and a total of five available colors (seven models in total) with a matt or high-gloss coated display lid. The other hardware equipment as a small tempation: The Eee PC works with the integrated Intel GMA 3150 graphics unit, which doesn't provide a performance gain, a 250 GB Seagate hard disk and a 1 GB DDR3 10600s RAM, beside the fresh Intel Atom processor. Asus doesn't have a 2 GB RAM netbook model available. Also, an optional UMTS module is only indicated on the case until now. Asus will release the Eee PC 1015PEM for 349 euro, including added value tax, in seven alternatives in stores and online shops. Slightest novelties are found in the case area. Asus deliberately waives on fundamental changes in design. 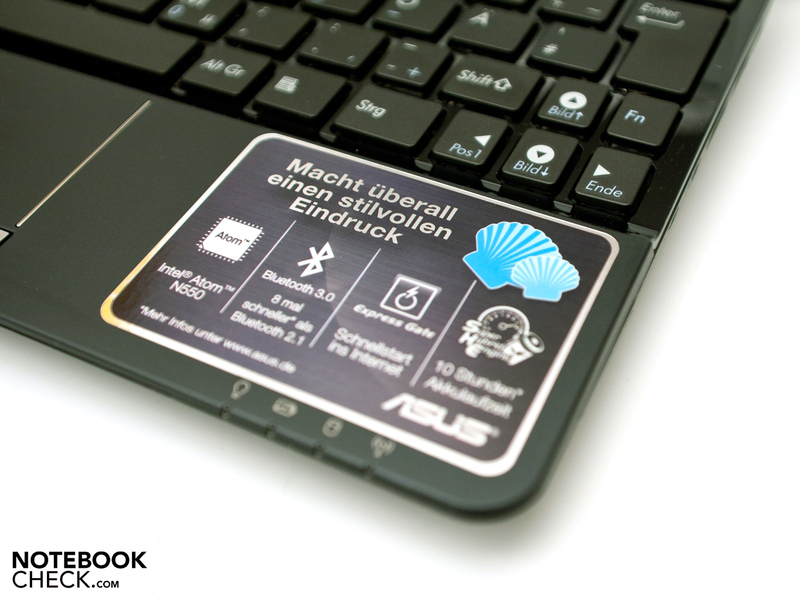 The Asus Eee PC 1015P/PE's tried and tested seashell case has been maintained and is still convincing. The workmanship of the used plastic is good and manufacturing flaws or uneven gaps on the sides can't be found anywhere. 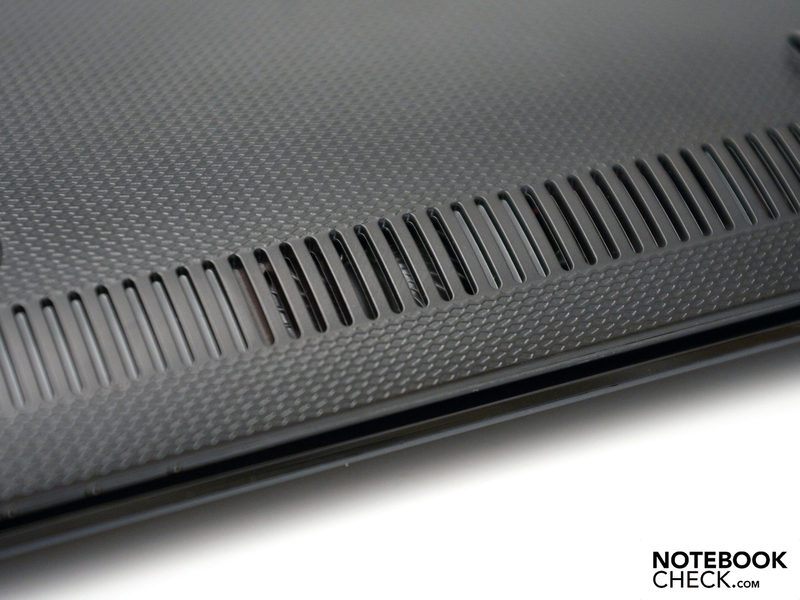 In comparison to smaller alternatives with Intel's Atom N450 CPU, Asus doesn't apply any unusual textures on the display lid. It also is restricted to five colors or two lacquer alternatives. Thus, the display lid is just only pepped up by a small Asus logo. The models with a glossy display lid (black, white, pink) are very chic, but prone for scratches, fingerprints and dust. On the other side, there are models in black, white, blue and red with a matt finish that are comparatively plain. Due to this variety, the user has a great choice of options that has to be rated positively. In opposition to the matt outside, the inside is made with a high-gloss finish, which adds a nice accent. Another eye-catcher is the large touchpad. It attracts attention with applications in a chrome look and which fit well in the optical concept. The case stability is convincing. The display bezel is rigid, but allows itself to be twisted slightly. 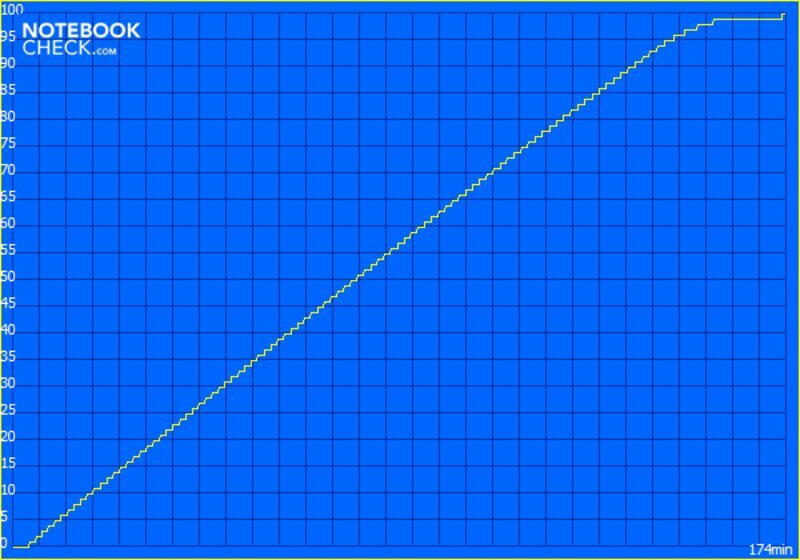 The size of 26.2 x 17.8 x 2.5 - 3.6 centimeters (w x d x h) and the weight of 1.25 kilograms (marginal weight difference) haven't changed in comparison to the Eee PC 1015P. 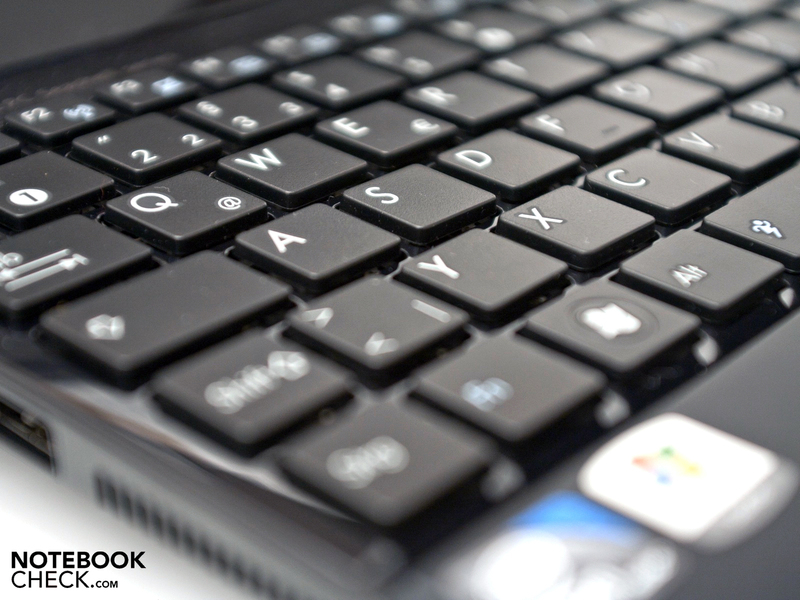 The connectivity is the known netbook standard. Nevertheless, you'll have to do without special interfaces or features. 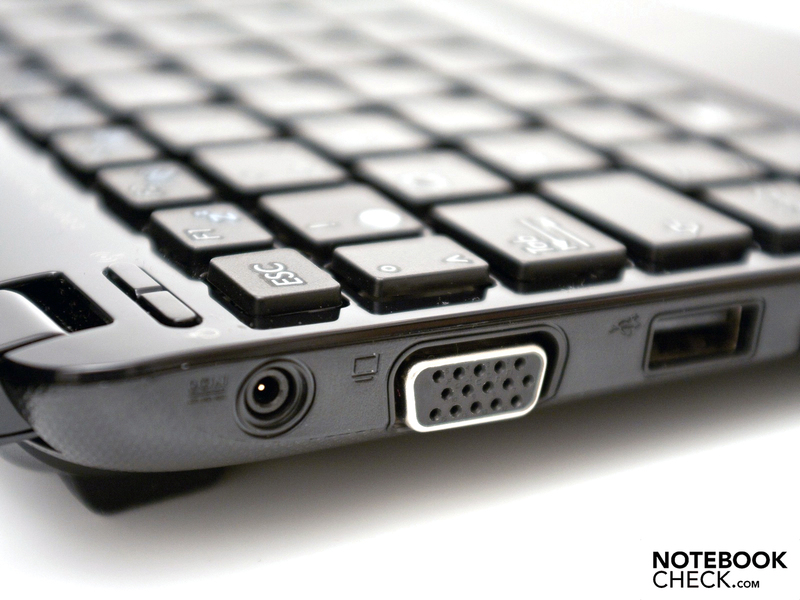 The socket for the included adapter, a VGA out for connecting a monitor or laptop projector and a USB 2.0 port for peripherals are found on the left. The other side supplies a larger range of interfaces. 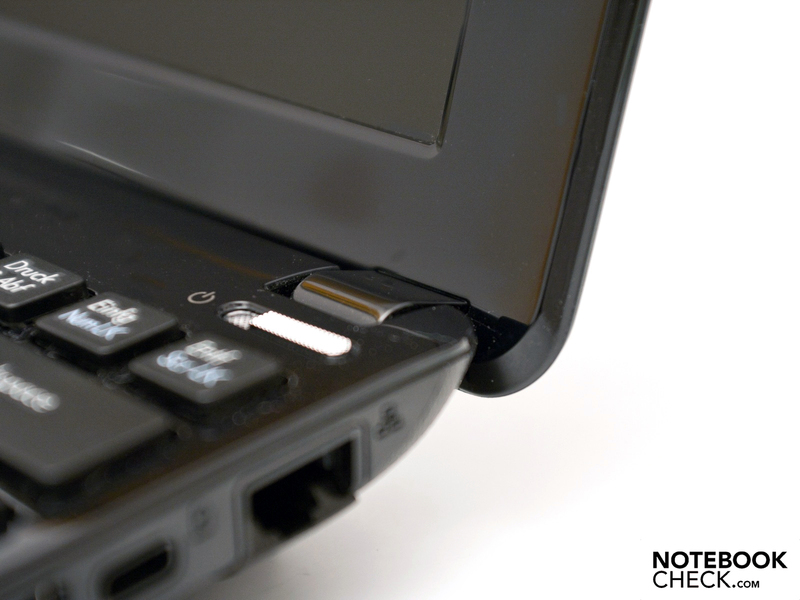 Aside from the standard 3-in-1 cardreader (SD, SDHC, MMC), the audio sockets (headphone out, microphone in), a further two USB 2.0 ports, a Kensington Lock and a RJ-45 jack are found here. This socket is inserted elegantly into the bottom side by a cover. The case's front and rear don't have any interfaces. Merely the status LEDs, respectively the large 6 cell battery with 47 watt hours (Wh) are found here. Asus has done a good job with the interface distribution. The range is meager as usual, but still acceptable. You will have to waive on the latest USB 3.0 port in this starter device available for about 350 euro. Despite the new Intel Atom N550 processor, there isn't a HDMI port available (Pine Trail platform). 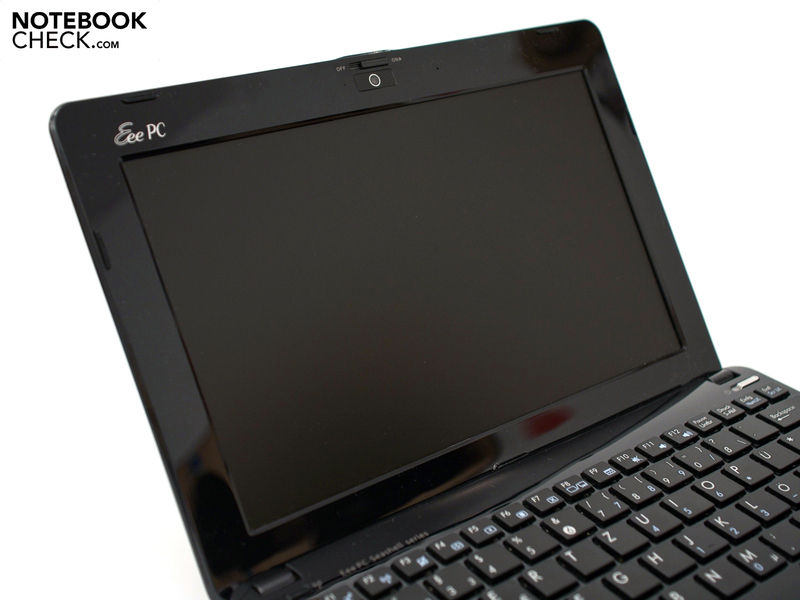 The communication options are very extensive and the Eee PC can even keep up with larger subnotebooks. Beside a Gigabit Ethernet (Atheros AR8132), there is a faster WLAN 802.11n standard (Broadcom controller) and Bluetooth 3.0. This new Bluetooth Special Interest Group (SIG) standard (theoretically) has an eight times higher transmission speed in comparison to version 2.0. Asus doesn't currently offer a 3G UMTS module. However a dummy slot is already built in. The netbooks scope of delivery is meager as usual. 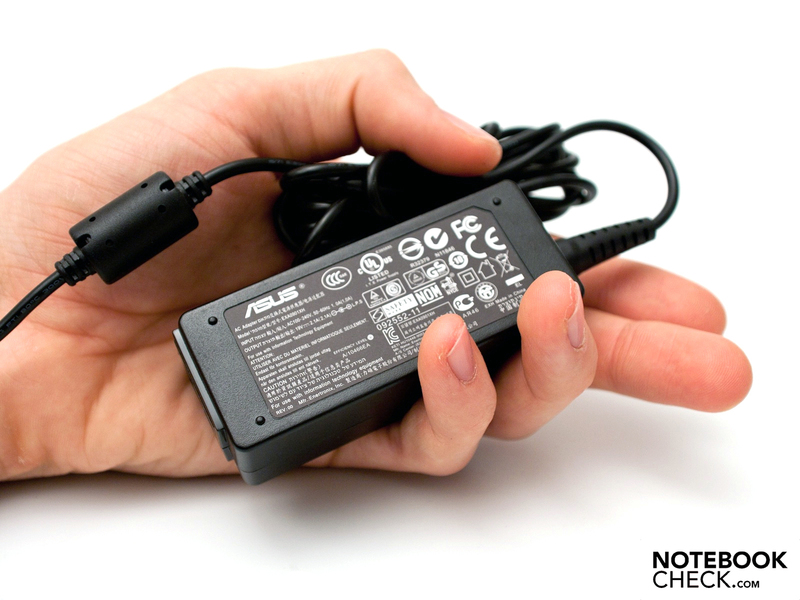 Aside from the actual netbook, you'll find the matching adapter with cable, a short manual, the warranty card and the 6 cell battery with 47 wh. Asus has a warranty period of 24 months including Pickup & Return service. Asus optionally offers a fitting protection cover for 25 euros and a carrying case for 39 euro (both RRP, incl. VAT). 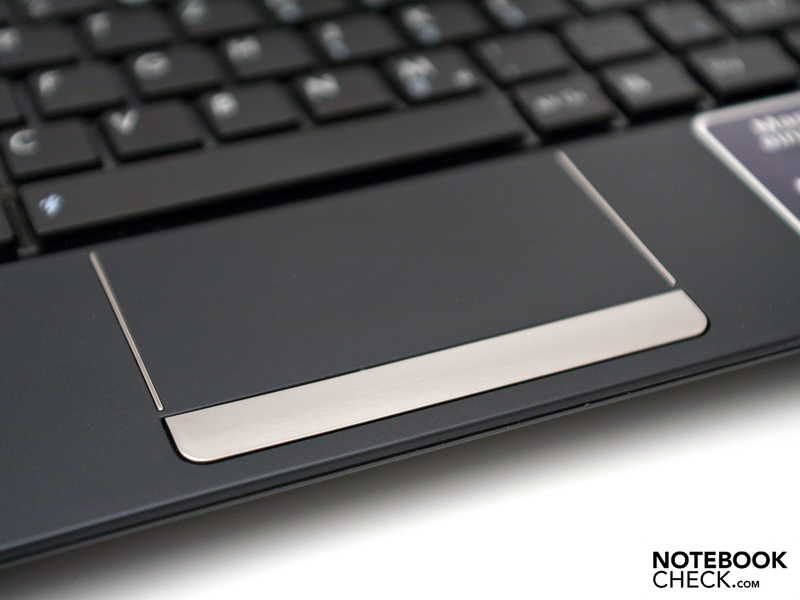 The tried and tested chiclet keyboard with a key size of 14x14 millimeters as used in the weaker model has remained unchanged. The layout corresponds to the German standard. The stroke length and pressure point are very agreeable. We would have been pleased if Asus had revised the small shift keys so that the ergonomics would have been improved. The large touchpad has also been maintained. It has good haptics due to the matt finish. The diagonal of 8.7 centimeters is also impressive. A vertical scroll bar has not been incorporated. 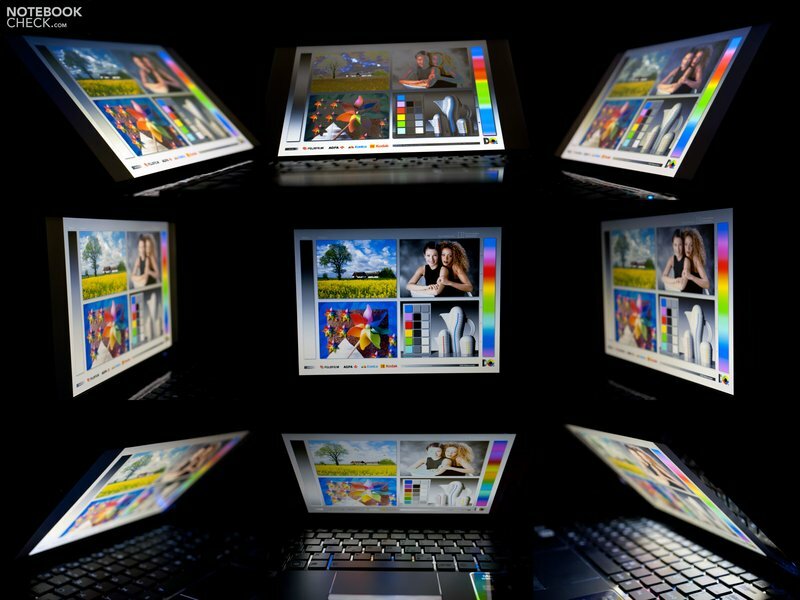 Modern multi-touch gestures simplify netbook use. The mouse replacement keys are hidden in a large bar made in a chrome look. They also have a good pressure point. 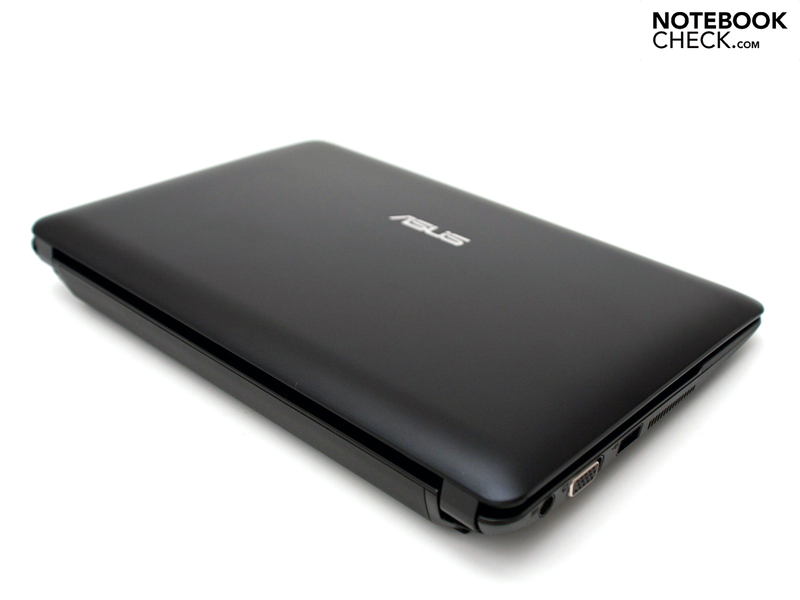 The Asus Eee PC 1015PE is equipped with a matt 10.1 inch display. It's also to be suitable for outdoor use. The screen has a native resolution of 1024x600 pixels in a 16:9 format. Higher resolutions (interpolated) have also now found the way into the netbook. It's possible to choose resolutions of 1024x768 and 1152x864 pixels in the system preferences. The installed LED backlight's liquid crystals also bid good brightness rates beside an even illumination. 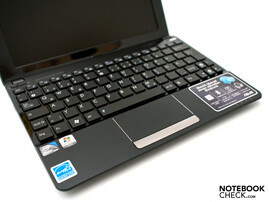 The maximum rate of 242 cd/m2 is in the top third field of netbooks. 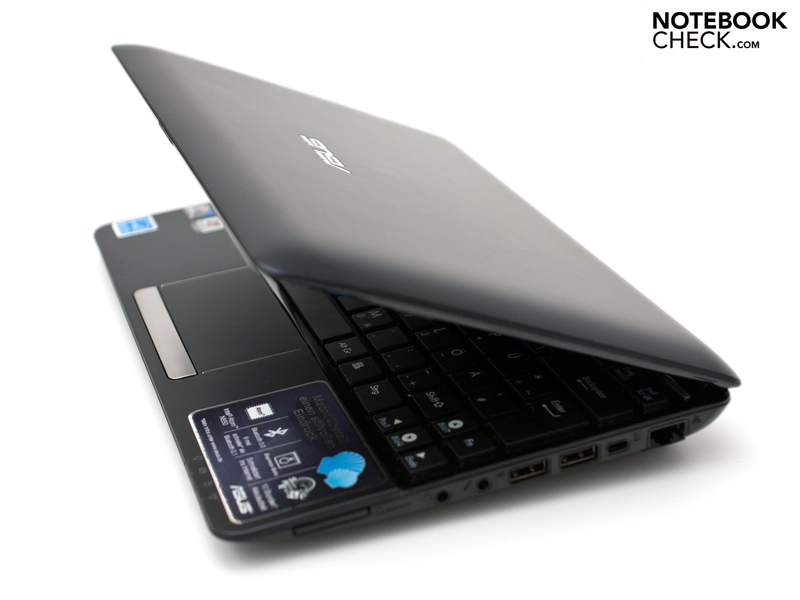 Nevertheless, our test device can't compete with the "wonder screen" of Asus' Eee PC R101. The average of all measured rates has to also be assessed with "good" with 228.6 cd/m2. The illumination of about 90 percent is very even. Other advantages of the screen are a low black value of 0.22 cd/m2 and its resulting high contrast of 1073:1. These are the perfect requirements for an outdoor use. 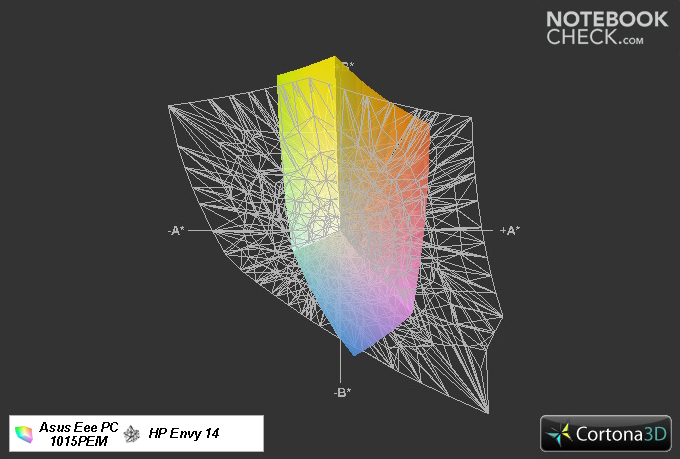 The subjective impression of color representation, contrast and focus is convincing. Our assessment with the X-Rite i1Display 2 tool, classifies the used display in the wide range of standard netbook screens. A netbook won't likely be interesting for professional makers anyway. Outdoor use is possible because of the display's good rates. The content is legible in direct sunlight or light incidence, but the colors bleach noticeably. An indirect light source in the office or a seat in the shade isn't a problem. The image is displayed well despite bright surroundings. The glossy display bezel is disturbing outdoors because it reflects intensely. The viewing angle stability is, as usual, only convincing to a part. The horizontal reproduction remains stable up to about 165 degrees even in narrow angles. Color falsifications don't turn up here. The vertical plane isn't very stable. The image quickly becomes illegible and inverts. Now to one of the most important parts of the review - the new Intel Atom N550 dual core processor. How well can the combination with the incorporated Intel GMA 3150 graphics unit do? Considerably more performance or just a narrow performance boost for a surcharge? The Intel Atom N550 is still based on Intel's Pine Trail platform and is manufactured in a 45 nanometer structure width. New are the clock rates of 1.5 GHz, two computing cores (4 threads), which are supposed to especially speed up multitasking, and a 1 MB L2 cache. This performance gain is also shown in the power loss (TDP) of 8.5 watts, which is about 2 watts more than in the smaller single cores, Atom 455. "Super Hybrid Engine" (software) supplied by Asus does not provide more performance by overclocking the processor in this device. Intel's GMA 3150 is and will remain to be responsible for graphics. The graphic unit incorporated in the processor only provides reserves for simple office applications with a core rate of 200 MHz. A suitability for new 3D games is almost excluded despite the N550 dual core CPU. Seagate's 2.5 inch hard disk with a memory capacity of 250 GB and a 1 GB DDR3 10600S RAM on one bank (1066 MHz) belong to the hardware equipment, as well. 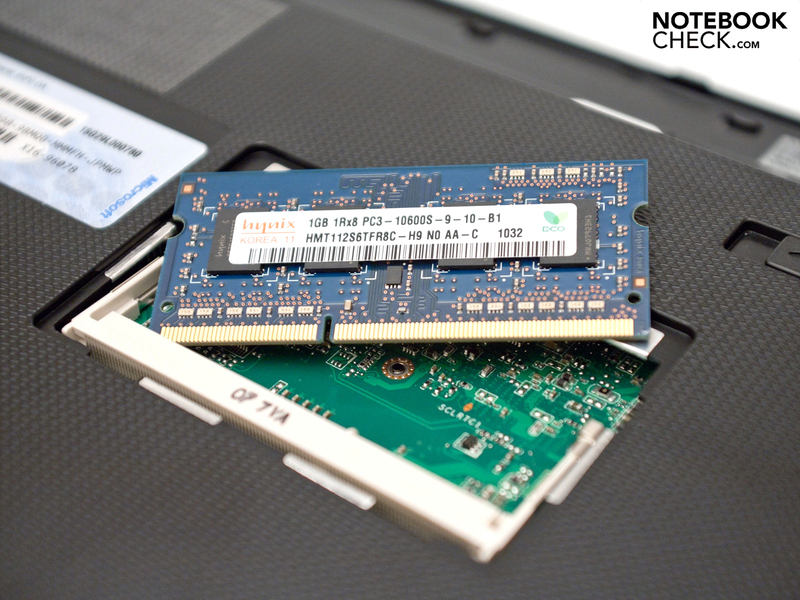 The RAM can easily be upgraded via a maintenance cover on the bottom (2 GB maximum). It's more difficult for the hard disk because it isn't directly accessible. We sent the netbook over various benchmarks, including games and HD videos, to record the Asus Eee PC 1015PEM's performance. Windows 7's high performance profile and the Super Hybrid Engine's "Super Performance Mode" were always enabled during this. The clock rate isn't boosted in this constellation and stays at 1.5 GHz in both computing cores. We checked the application performance with PCMark 05, Vantage and CineBench R10. 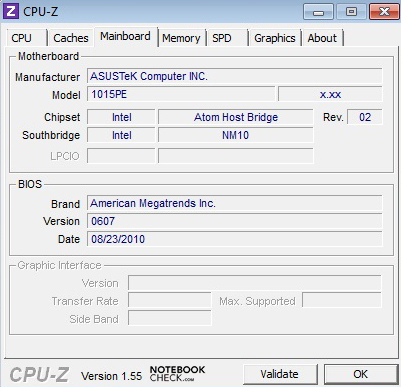 Additionally, Asus' Eee PC 1018P with Intel's Atom N455 and a 1 GB DDR3 RAM was used as a basis for comparison. Both the older 05, as well as the latest Vantage version of PCMark certify good rates. Our test device stands out evidently, with 1663 points, from its colleague with a single core processor (score: 1053 points). Thus, it plays in the league of older ULV processors in combination with an Intel GMA 4500MHD graphics unit. The CineBench R10's results haven't changed much in single core rendering and Open GL calculation. The Atom N550 shows its strength in multi core rendering and sets itself apart from the 1018P with a N455 processor (score: 872 points) with 1504 points. The new Intel Atom N550 can also disconnect from the mass of netbooks with single core processors in the CPU benchmark, WPrime (1024M, 1995 seconds). 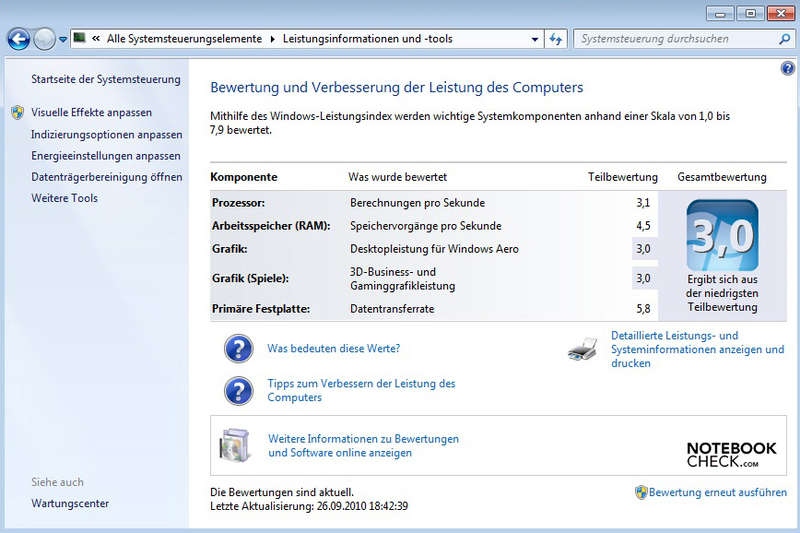 Windows 7's performance index has also risen and is now by 3.1 instead of 2.4 points (N455). 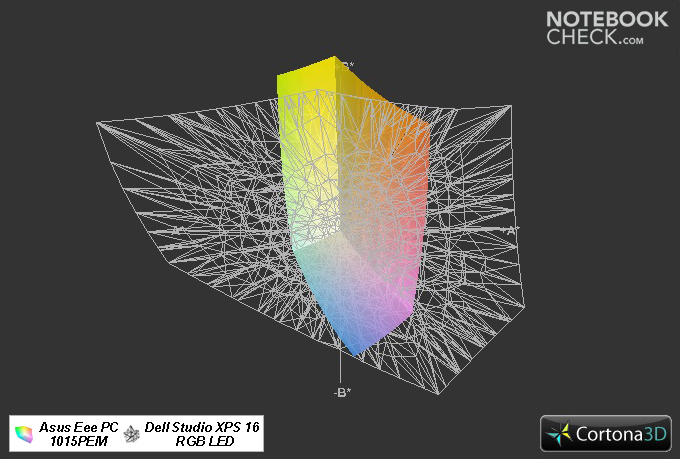 The graphics unit rate has slightly turned to its advantage with the new processor. The 3D performance has only changed marginally to not at all, since Intel's GMA 3150 with a core rate of 200 MHz is used. The Asus Eee PC 1015PEM is in the range of the netbook mass with Intel's Atom N450 in 3DMark 06 and can't claim an advantage. A combination of the strong Nvidia ION 2 graphics unit, aka Nvidia GeForce GT 218 and Intel's Atom N550 would be beneficial for graphic concerns. A 2.5 inch drive from Seagate is used as the memory medium. It works with a maximum of 5400 revolutions per minute. In our case, the Momentus 5400.6 supplies a gross capacity of 250 GBs and has a construction height of 9.5 millimeters. 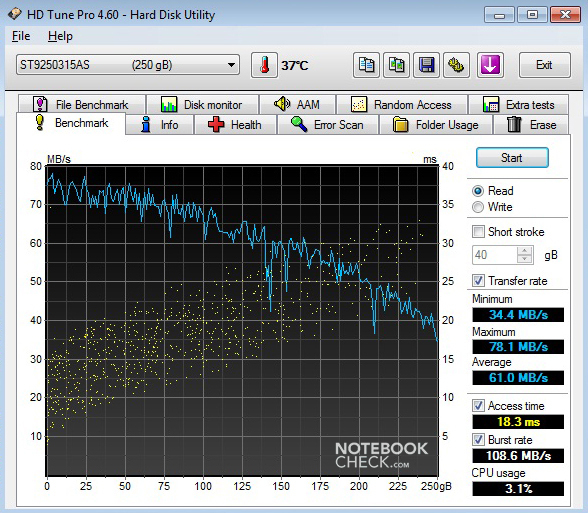 We consulted the tools "HD Tune Pro 4.6" and "CrystalDiskMark 3.0" to determine the hard disk's performance. 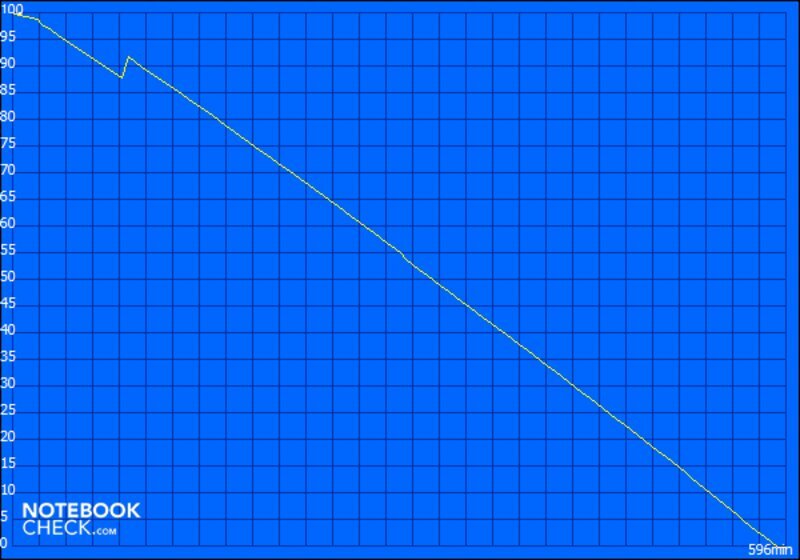 The assessed rates are on a similar level, whereby CrystalDiskMark determined 73.52 MB per second (sequential read) and 73.19 MB per second in write processes. 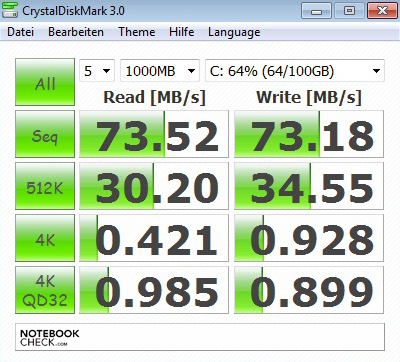 Overall, the Seagate Momentus is thus in a good midfield for a 5400 rpm drive. You still have to regrettably do without videos in 1080p. They do not run smoothly on the internet or locally on the computer. However, the CPU load has dropped a bit. Videos in 1280x720 pixels (720p) can be rendered with restrictions. The YouTube video, in our case the HD trailer from "The Social Network", runs much smoother than in the Asus Eee PC 1005PE with Intel's Atom N450 and Intel's GMA 3150 graphics unit, even if not completely without jitters. A stable 720p playback is only possible on the netbook locally until now. Basically, everything is a bit smoother, but real movie entertainment isn't possible without an HD decoder. We tested the pure gaming performance with various games dated from 2004 to 2010. It quickly becomes evident that the Eee PC 1015 PEM is only in the red. The frame rates (fps) are overall very low and don't stand out from Dell's Inspiron Mini 1018 with an Intel Atom N455. Merely TrackMania Nations Forever runs fairly smooth with minimum graphic settings, but it's not fun. A combination of the new Intel Atom N550 and a stronger graphics unit would also be more interesting for more power here. Asus hasn't made modifications on the cooling system, despite the new processor. 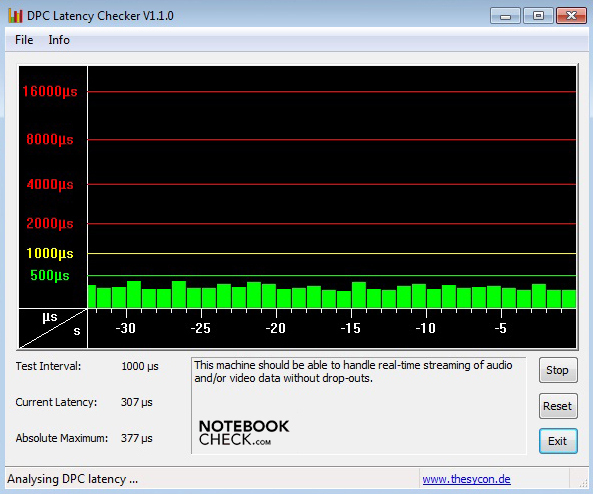 The netbook works almost silently in normal use with a maximum of 31.0 dB(A) and you hardly hear it. 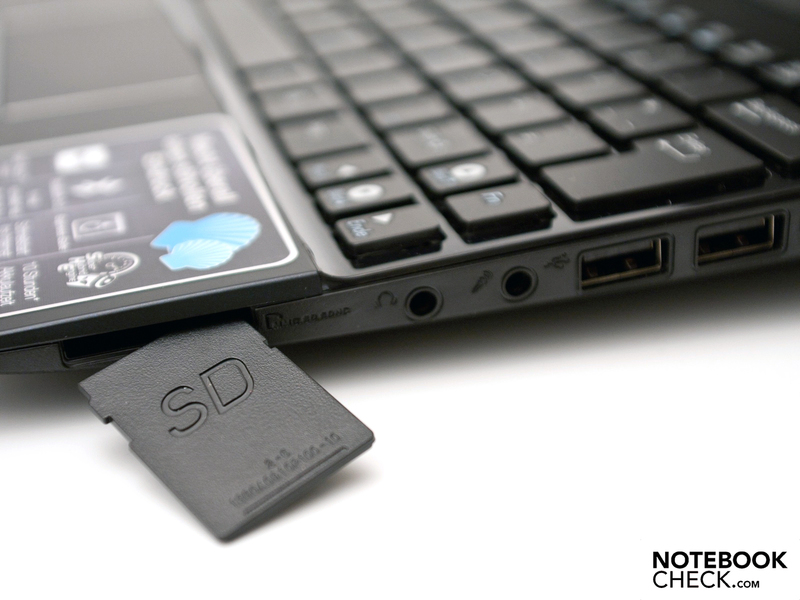 Seagate's notebook hard drive works on the same level (31.0 dB(A)) and is thus within the range of memory media with a maximum of 5400 revolutions per minute. We could determine 33.2 dB(A) when the integrated components were loaded to the full. There often is a combination of a good cooling system but annoying operating noise levels or vice versa found in most notebooks. The 1015PEM stays cool and works quietly at the same time. A maximum of 31.9 degrees Celsius develops on the case bottom in normal use. This rate is convincing and heating is hardly noticed. The rates only increase slightly under load and are still within an acceptable range. As so often, the maximum rate of 33.2 degrees Celsius is found in the vent's area because air accumulates here. Overall, the rates remain inconspicuous for this configuration. 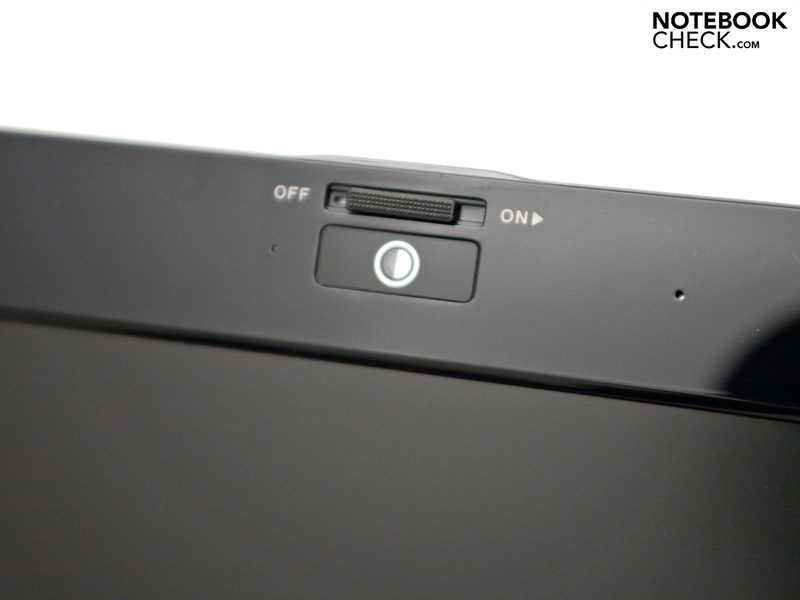 The Intel Atom N550's plus on performance has an impact on the power consumption and thus on the battery life. 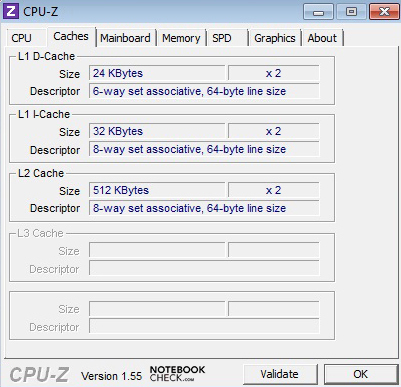 The new dual core processor has a power dissipation (TDP) of 8.5 watts. 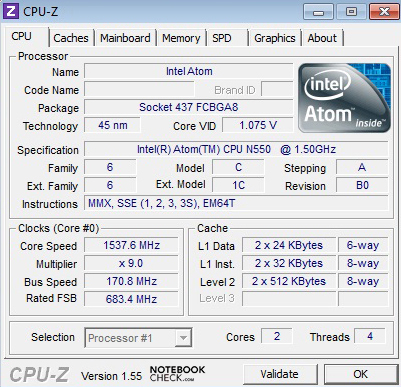 An Intel Atom N455 needs about 2 watts less with 6.5 watts (TDP). Our test device consumes between 7.6 and 11.6 watts in the ideal mode. These rates climb to a maximum of 16.1 watts under load. 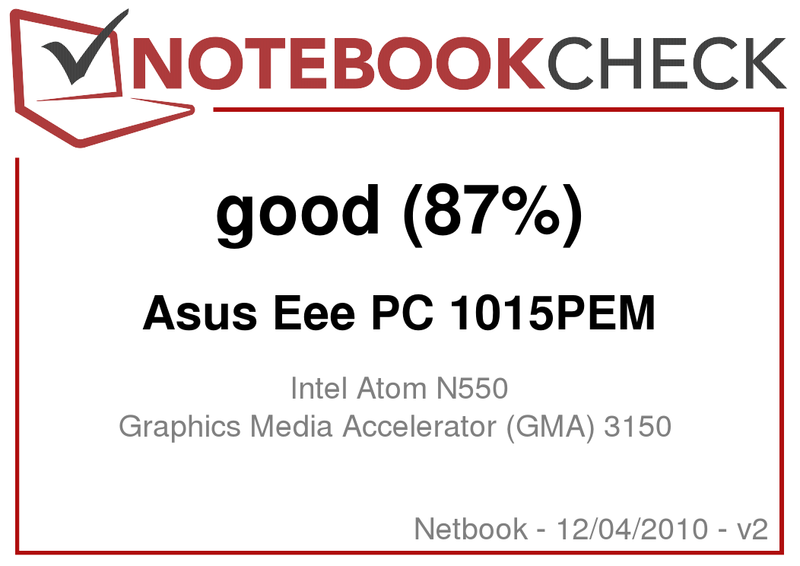 An obvious difference to the Asus Eee PC 1018P with Intel's Atom N455 becomes evident, as it only needs a maximum of 11.4 watts. Asus relies on a 6 cell battery, which now has a marginally higher 47 watt hours instead of the 44 watt hours, to compensate the higher power consumption. BatteryEater's "Classic Test" simulates the maximum load. 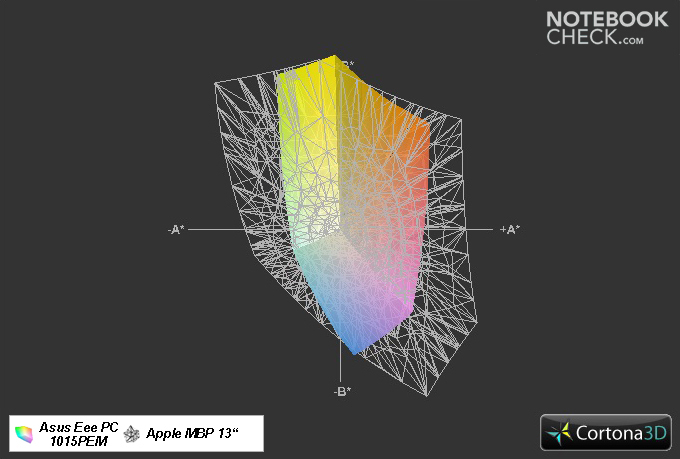 A complex Open GL calculation with maximum display brightness and enabled mobile technologies is executed for this. 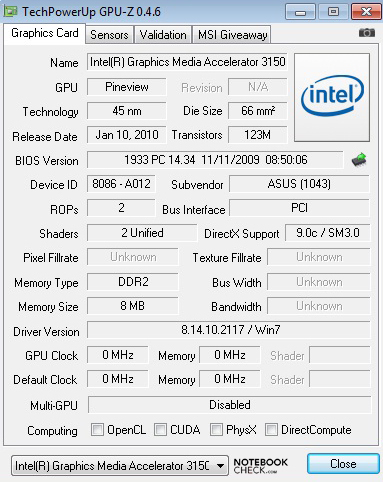 Additionally, Windows 7's high performance profile and Asus' Super Hybrid Engine's "Super Performance Mode" are active. The battery is drained and it has to go back to the mains after a short 3 hours and 42 minutes. If you only want to check and write emails and surf on the internet with good display brightness, you can achieve a good 6 hours and 48 minutes. The Asus Eee PC 1015PEM loses about 35 minutes in comparison to the Eee PC 1018 with weaker equipment in this real-life scenario. The runtime with the lowest hardware load can be recorded with "Reader's Test". For this, the display brightness is minimized and the mobile technologies disabled. Furthermore, the energy savings functions of Windows 7 and the Super Hybrid Engine now apply. The processor is clocked down to almost 1 GHz in this scenario and consumes less power. 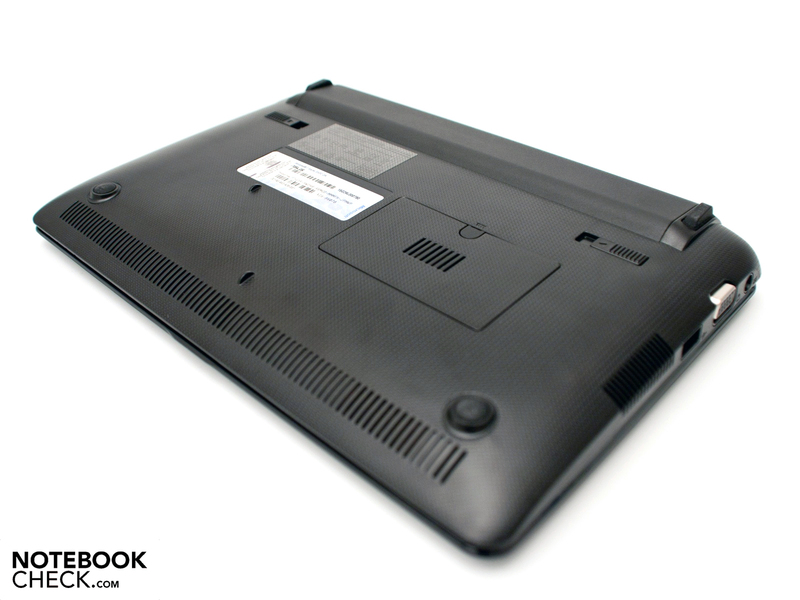 The dual core netbook can compete with its "simple" colleagues and provides a good operating time with a maximum battery life of 9 hours and 56 minutes. 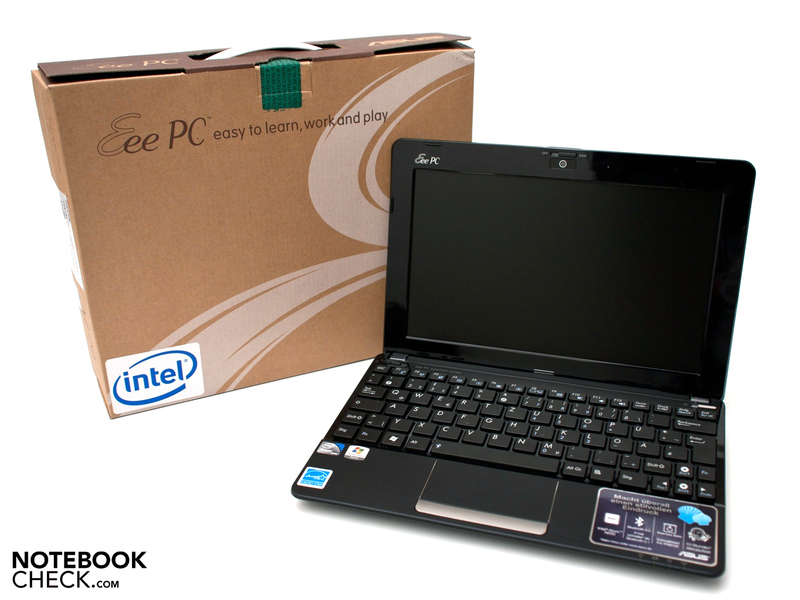 The Asus Eee PC 1015PEM leaves a good impression. However, life on the fast track won't be possible with it. The new Intel Atom N550 accelerates simple office tasks and Windows 7 Starter's performance noticeably. But it doesn't supply more performance for games and HD videos. If you want to also enjoy HD videos and games on a netbook, you should look out for a HD decoder or a stronger graphic unit. The 1015P's advantages have been maintained. Thus, there still is a very good 10.1 inch display with a matt surface, a large touchpad and a very quiet, as well as efficient cooling system are found. Another positive aspect is the new color alternatives with two surface coatings (matt/glossy). 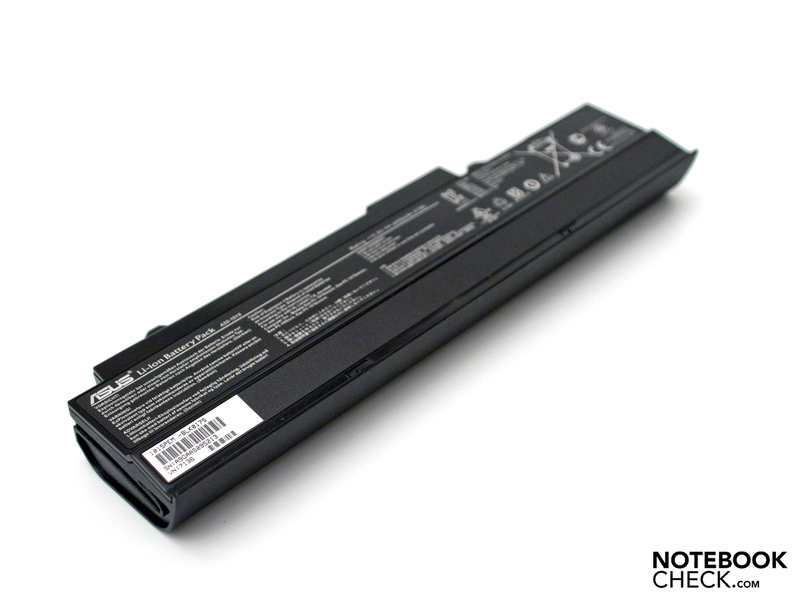 The battery life is designed a slight bit shorter than that of the single core netbooks due to the somewhat higher power consumption. It nevertheless remains to be within an attractive range with 6-7 hours in practical use. All in all, the Asus 1015PEM is an attractive N550 starter device with the usual equipment, good office performance and a fair price of 349 euro including added value tax (RRP). 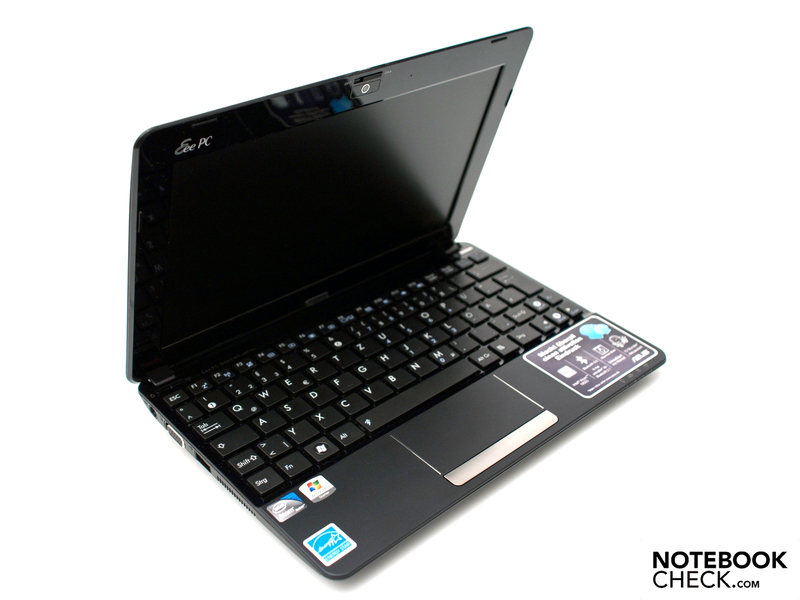 In Review: Asus Eee PC 1015PEM Netbook with Intel Atom N550. 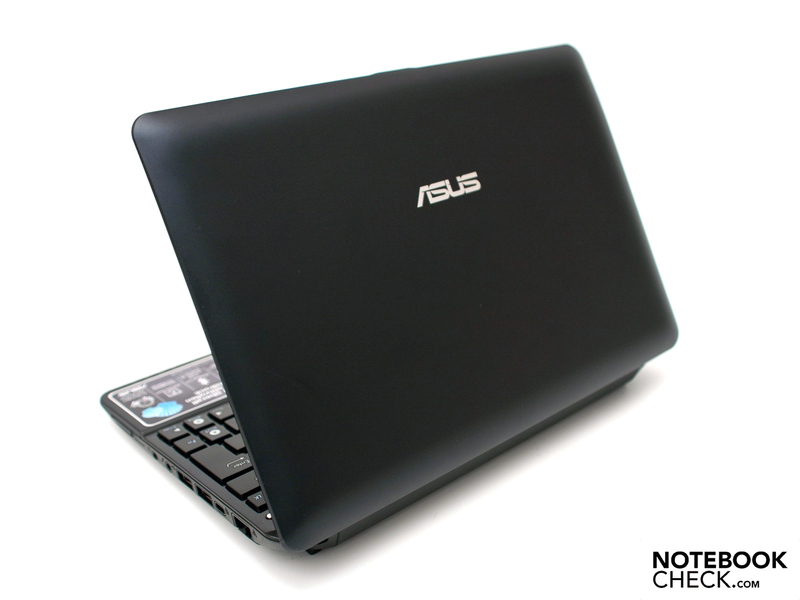 The first netbook by Asus with Intel's Atom N550 is called Eee PC 1015PEM. 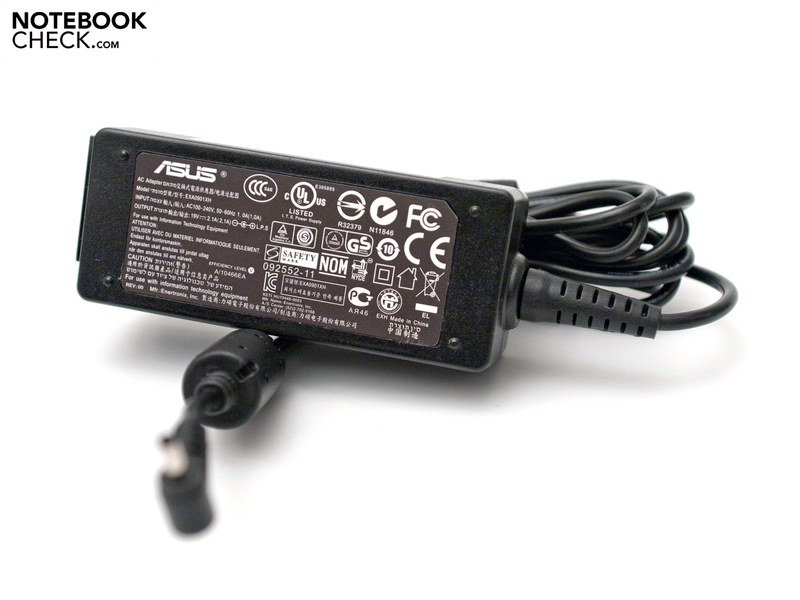 The adapter is made in the netbook's color and is pleasantly light (155 grams). A big 6 cell battery (47 Wh) suffices for a day in the office. The stereo loudspeakers' sound quality isn't convincing. 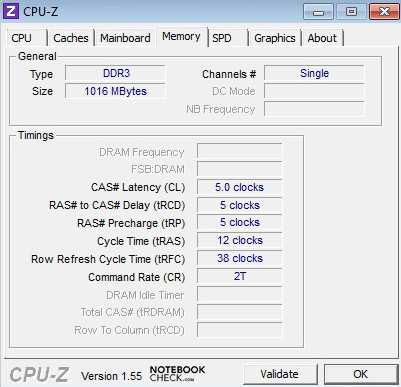 The DDR3 10600S RAM can be upgraded to 2 GBs. The bottom is textured and, as usual, clearly arranged. The latest Bluetooth 3.0 standard and the Super Hybrid Engine are naturally onboard. The hinges have a good grip, but they still teeter. The camera cover protects privacy and is increasingly used. The keyboard bids a pleasant feel and a good workmanship at a size of 14 millimeters. Cardreader and three 2.0 ports comply with the standard. The Intel Pine Trail platform only bids an older VGA out. These colors don't cost extra and every model is priced at 349 euro (RRP). ... Asus has more color alternatives in matt and glossy. The construction height is convincing and doesn't make an oversized impression. The design, the available alternatives, the Intel Atom N550's good office performance and the good cooling system. A larger scope of delivery, a 2 GB DDR3 RAM ex-factory, an optionally integrated UMTS. 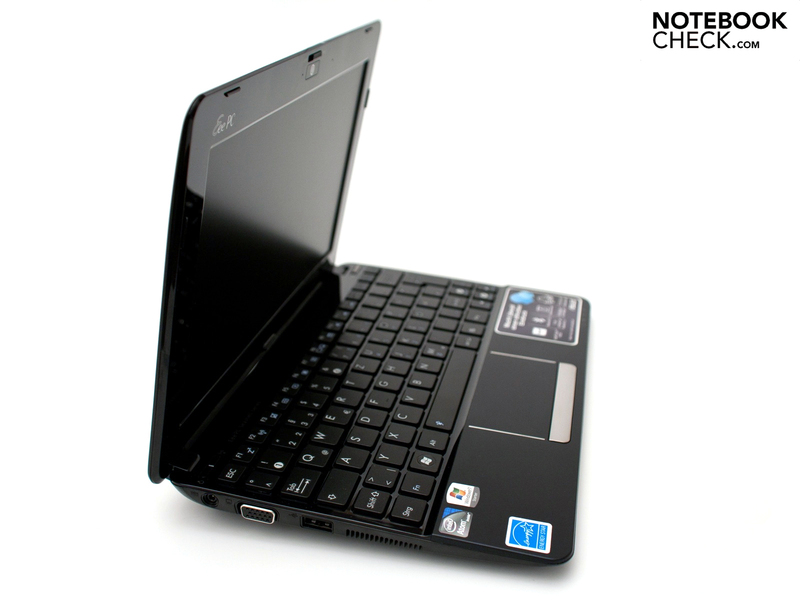 The dual core netbook's low start price and the good 10.1 inch display with a matt surface. Current devices with Intel's Atom N550 processor, which are or will be available on the market in the next few weeks. Amongst other, for example, Acer's Aspire One D255, HP's Mini 210 und 5103 and 5103, MSI's Wind U160 or Samsung's N350 with LTE wireless technology.